You can see from our family photo that we are not your typical family. 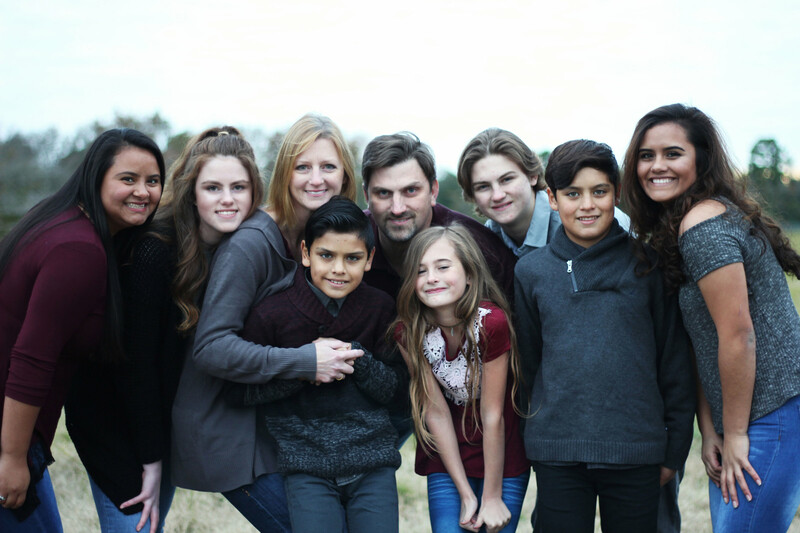 My wife, Vanessa, and I have 7 children — five of them entered our family through adoption. When we got married nearly 22 years ago, we did not imagine our life looking like this. I was an engineer student at Baylor nearing graduation and hoping to land a nice-paying job in the Waco area where Vanessa was already working. Upon graduation, I landed that job and was pleased with my starting salary of $37,000/year working for a defense contracting company called Raytheon. We began living the dream — buying a house, adding 2 dogs, planning for our first child. When our daughter Emily was born, things began to change. We knew about some changes coming like lack of sleep and how she would have us wrapped around her little finger. But what we didn’t expect was the change of heart with our work. We no longer wanted to keep doing what we were doing. Vanessa wanted to stay home with Emily and my childhood desire to build homes was reawakened. Construction was an interest at an early age — when I was four years old I walked into my home and declared to my parents that I was going to work in Construction when I grew up. Why? Because “you can get dirty and get paid for it!” I happily concluded. What remains constant with my company, is that when my clients build with Evermon Homes, they get me. I am hands-on, on-the-job, with you from start to finish. So in 1999 I had the opportunity to move to the Houston area and build, learning much from my first 2 employers. In 2003, with the experience and knowledge I gained those first 4 years in building, I started Evermon Homes. Our family and business has expanded over the last 14 years in ways I could not have planned myself. If you want a more personal story of our family growing over the years, you can check it out on Vanessa’s blog. What remains constant with my company, is that when my clients build with Evermon Homes, they get me. I am hands-on, on-the-job, with you from start to finish. My wife works in the office and some of my kids may show up on the job from time to time to earn some money cleaning it up. My youngest son keeps reminding me that my days are numbered as owner of this company and he is making his plans to take over. We are not your typical family-owned business, but again, we are not your typical family. We count it a privilege to provide for our family and those who work with us through the work we do with Evermon Homes. And we desire to serve our clients in a way that they count it a privilege as well. © Evermon Homes, LLC. All Rights Reserved. Site Design by Johnnyo Design.